The first gay uprising in the United States occurred ten years before Stonewall, on the opposite side of the country. Photo: The Beanery, 1969, by Pat Rocco. Courtesy of ONE Archives at USC Libraries. In May of 1959, a group of drag queens and hustlers fought cops in a donut shop in downtown Los Angeles, furious that LAPD officers were arresting their friends purely for legally congregating in Cooper’s Donuts, a popular gay meeting place. 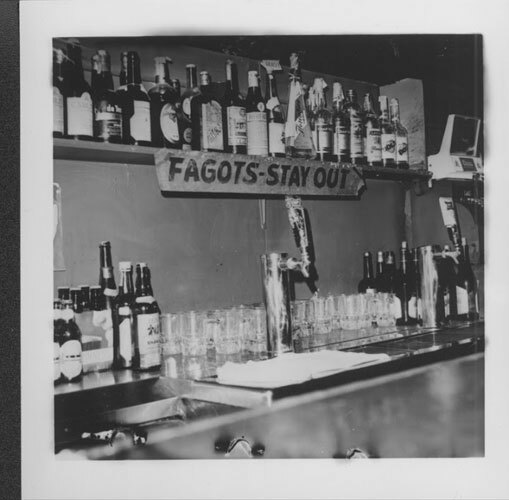 Cooper’s was located on Main Street, the Los Angeles “gay ghetto” of the 1950s and ‘60s. In his landmark novel City of Night, novelist John Rechy describes the area as teeming with hustlers and transvestites, who were routinely arrested and locked up by the LAPD just for being seen together on the street or in a raided bar. Rechy was in fact one of three people the police tried to arrest that night in May of 1959, when the patrons of Cooper’s had had enough. A large group of transgendered women and others pelted the officers with donuts, coffee, and paper plates until they were forced to retreat and return with larger numbers. Rechy managed to escape, but when the police returned a riot ensued that shut down Main Street for an entire day. That night is widely considered to be the first gay uprising in modern history, seven years before the Black Cat Riot in L.A.’s Silverlake neighborhood, and ten years before the Stonewall Rebellion. The event is chronicled in detail in Gay L.A.: A History of Sexual Outlaws, Power Politics, and Lipstick Lesbians, a meticulously researched book that positions Los Angeles—and not New York—as the most influential gay city of modern times. It includes an exhaustive account of the landmark Mattachine Society, which was founded by a group of brave gay L.A. men in 1950. Harry Hay, one of its founders, became an institutional voice for the burgeoning gay rights movement, and Hay’s accounts of early LGBT history are included at length. By Hay’s recollection, there were even earlier riots and uprisings in which gays and transgendered Angelenos were instrumental in resisting police, but Cooper’s was the first such uprising specifically against police treatment of LGBT people. The LAPD had a reputation for brutalizing LGBT residents, one that continued well into the 1980s, and the arrests in May 1959 were the first of last straws. People around the world will celebrate international Pride Month this June, in honor of the June 1969 Stonewall uprising at the Stonewall Inn in New York’s Greenwich Village. The Inn itself still stands, and will be made an official New York City landmark soon. In Germany, Pride celebrations are known nationally as “Christopher Street Day,” in honor of the Stonewall’s address. Yet, there a few celebrations of the first uprising of this kind, a night of queer empowerment and resistance in the midnight hours of the 1950s. If June is dedicated to Christopher Street, May should most certainly be dedicated to Main.